The latest version of the FSI IP Remote utility is now available for DM series monitor and BoxIO users. It features enhanced functionality that allows you to easily resize ScopeStream windows and adjust scope trace color. Flanders Scientific has announced that the upcoming XM550U will become the XM650U! Here’s an example of the awesome work that our customers do with the systems we supply them. See how ABS-CBN and Central Digital Lab give new life to classic Filipino films, using tools such as the Blackmagic Cintel Film Scanner, DaVinci Resolve and Phoenix Film Restoration software from Digital Vision. Read the full article from SPOT.ph here. Fremont, California, USA – July 20, 2017 – Blackmagic Design today announced the new Cintel Audio and KeyKode Reader accessory for its Cintel Film Scanner, which lets customers scan audio and KeyKode information along with images from the scanner, all in realtime. The new audio and KeyKode reader accessory is available for US$3,495 from Blackmagic Design resellers worldwide. Resolves DM240 Fast Mode bugs (flashing white dot in lower left of screen and image shifting 1 line lower). BoxIO’s new ScopeStream capability, first announced at NAB 2017, is now available as part of a public beta release of the updated BoxIO Utility application and BoxIO firmware. 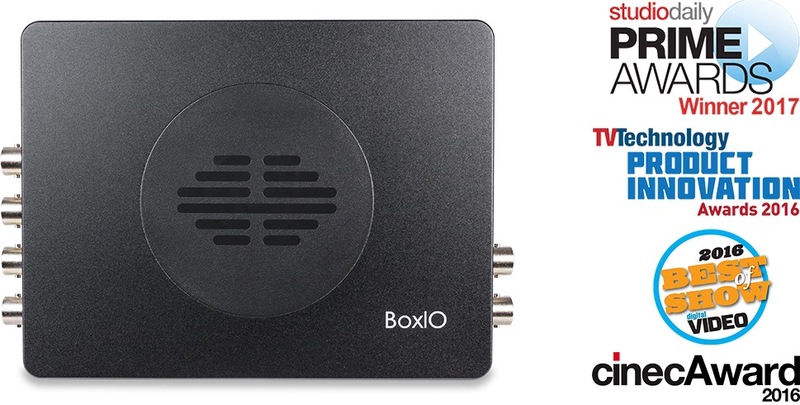 The updated utility allows multiple BoxIO devices to be connected, each supporting its own real-time Waveform and/or VectorScope stream. We characterize BoxIO as an Advanced Color Management device because it is more than just a LUT box and ScopeStream is another great illustration of that point. With a single device you can apply LUTs in real-time, take full resolution frame grabs, view waveform and vector scope, and a whole lot more. Best of all, you get all of these capabilities for a price that is comparable to devices that do little more than just apply a LUT. -Bram Desmet, CEO/GM Flanders Scientific, Inc. The Media Village is pleased to return to Broadcast Asia (Booth #6G4-04)! Do take note that the show has moved back to Suntec Singapore this year and is no longer held at the Marina Bay Sands Convention Centre. Once again, The Media Village will be showcasing the latest updates and releases from a host of our leading edge partners. Flanders Scientific wins yet another award for its’ DM240 Color Critical Production Monitor, this time being included in TV Technology’s NAB 2017 ‘Best of Show’ Award.